Where have I been since my last post…about two months ago? As a blogger, I get a big FAIL in the regular posting department, I guess, but for as much as I get frustrated about the difficulty in finding time to blog about the very many things I would like to share with my readers, I also realize that we all (even me!) need to take time for a little respite. Sometimes the task of living through a regular work week seems more daunting than climbing Mt. Fuji, and yet, week after week, we make it through. But to what expense? I am a full time employee of Temple University’s Department of Public Health and still manage to work on a business at night — usually from 8pm until about 2am. That means i rarely get the much needed 7 or 8 hours rest critical to long-term health. It’s incredibly difficult to juggle blogging, social media, esty sales, shipping orders, and everything else that goes along with having a small business in the wee small hours of the morning. Did I mention that I’m married with a three year old too? I would say that just about 100% of the time I feel I’m neglecting someone or something, if not my own health — and certainly not doing everything that I believe I should be doing to “make it”. I look at the business owners of the Indie Beauty Business Network and think, “wow – how awesome would it be to be able to work on growing my business during the daylight hours?” But on the flip side, I have a full time job salary to lean back on when retail sales are low. This Spring I’ve made some choices that have also meant neglecting some things — such as blogging — a little bit, including taking a two week vacation to the Bahamas. But I have also been able to allow my body to rest, regain energy, and to hopefully provoke new gustos of invigorated creativity in future months. I have had to cut back on some of the hours I devote to my business, but I am also able to enjoy some local networking in the herbal community, including starting a facebook page devoted to the herby activities, workshops, events, and retail offerings in Philadelphia. Just spending a little more time in the evening with my feet up can also go a long way and during these very hot, very humid summer days, I’m able to allow new ideas to germinate, as well as plans for the future of Lilith’s Apothecary. 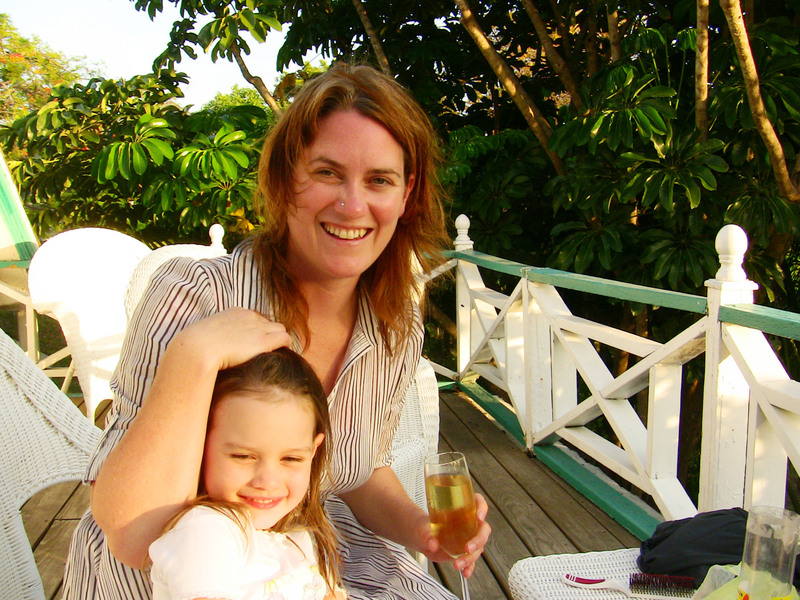 Tell me how you handle those times in your life when your body (and mind!) just say “Slow Down!” Do you listen or do you have to be made to stop? Ocimum sanctum. The very name seems hallowed and sacred somehow., don’t you think? Well, Tulsi, or Holy Basil, gets my vote for the numero uno herb for 2010. After 2009, we all need it! But you judge for yourself. From the Lamiaceae family, and called Tulsi (Hindi), surasa (Sanskrit), and sacred or holy basil, this wonderful herb has so much to offer us. A prized medicinal in Ayurveda, the 5,000 year old traditional medical system of India, we are all fortunate that holy basil has now found its way into the Western herbal reperatoire. And how can it be ignored? It’s an adaptogen, antibacterial, antidepressant, antioxidant, antiviral, carminative, diuretic, expectorant, galactagogue (promotes the flow of mother’s milk), and immunomodulator. But those are scientific terms to describe what Ayurveda has been attesting for perhaps 3,000 years: namely that this herb is a rasayana, a herb that nourishes a person’s growth to perfect health and promotes long life. 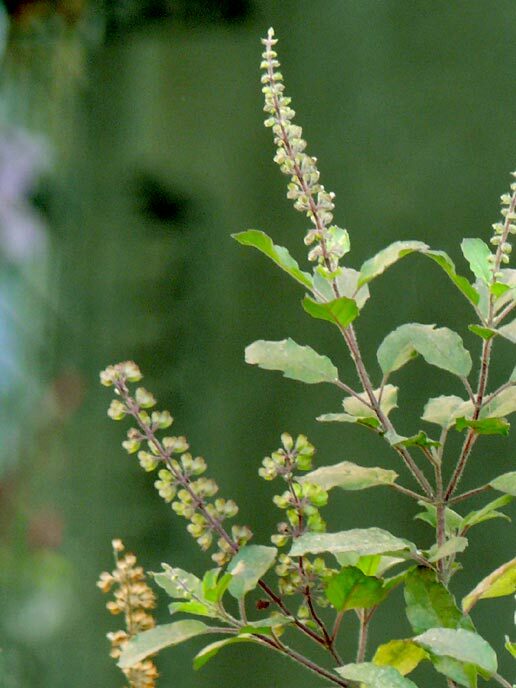 Tulsi’s uses in Ayurvedic history are myriad. Sacred to the Hindu god, Vishnu, holy basil is used in morning prayers in India to insure personal health, spiritual purity, and family well-being. Beads made from the tightly rolled plant stems are used in meditation for clarity and protection. The daily use of this herb is thought to support the balance of chakras (energy centers) of the body. It is thought to possess sattva (energy of purity) and as being capable of bringing on goodness, virtue, and joy in humans. 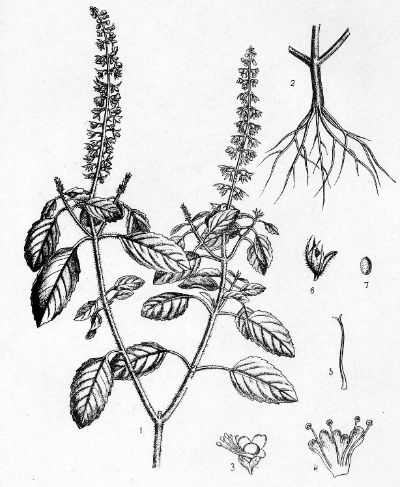 In terms of application to bodily disharmony or dis-ease, holy basil has many uses, including for nasal congestion, as an expectorant for bronchial infections, for upset stomach, for digestive issues, for soothing the urinary tract when urination is difficult and painful, and even to lower malarial fevers. Today this versatile plant is primarily seen as an adaptogen with antioxidant, neuroprotective, stress reducing, and radioprotective effects. It has also been shown to lower blood sugar levels, and can be a useful adjunct therapy for a diabetic. One of the primary reasons why I love the herb are for its stress reducing, anti-depressive effects. Clinical studies have shown significant anti-stress activity when the herb is taken as an alcohol extract, as it seems to prevent increased corticosterone levels that indicate elevated stress. Holy Basil is used to enhance cerebral circulation and memory, even to help alleviate the “mental fog” caused by chronic cannabis smoking. David Winston also advocates the use of Holy Basil in situations of ‘stagnant depression’, a classification of depression that he coined to describe a type of situational depression. As he describes it, “In this case, some type of traumatic event occurred in a person’s life, and because he is unable to move on, his live comes to revolve around the trauma. In addition to therapy, herbs such as holy basil, damiana, rosemary, and lavender are especially useful for treating this condition” (Winston & Maimes 2007). Tulsi is an adaptogen that helps the body alleviate stress, but certainly at the time of a traumatic event, and will also help lift spirits, provide clarity when it is most needed, and hopefully help prevent the formation of the stagnant depression as described above. There’s no question that in simplest terms, an herbal tea made with holy basil, rose petals, lavender, and perhaps a few other nutritive herbs would be a wonderful blend for someone recovering from loss. For long term therapeutic use, however, tincture form is probably preferred. Tea: Add 1 tsp dried leaf to 8 oz hot water, steep, covered, 5-10 min. Take 4 oz up to 3 x a day. Safety Issues: There have been contradictory animal studies showing that holy basil might be toxic to embryos. Until conclusive information exists, avoid using it during pregnancy. 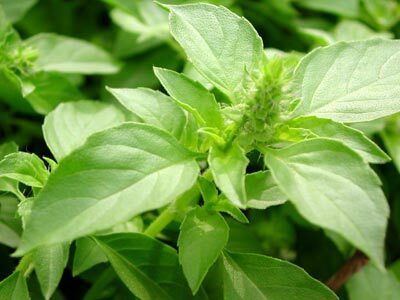 Holy Basil is also reported to have an antifertility effect and should be avoided if a woman is trying to get pregnant. It is perfect for after birth, however, as it helps increase milk production. Drug Interactions: Preliminary studies indicate that holy basil might enhance CYP-450 activity, thus speeding up the elimination of some medications. I prefer making a tincture from the fresh herb, which I purchase from Pacific Botanicals, an organic herb farm in Oregon. You can buy the dried herb from Pacific Botanicals, Mountain Rose Herbs, and other reputable companies. However, make sure the herb is green and aromatic, whether dried or fresh. You can purchase the tincture from me via Etsy or from Herbalist & Alchemist.